Phase-contrast microscopy visualizes differences in the refractive indexes of different parts of a specimen relative to unaltered light. A phase-contrast microscope splits a beam of light into 2 types of light, direct and refracted (reflected) and brings them together to form an image of the specimen. Where the lights are “in-phase” the image is brighter, where the lights are “out of phase” the image is darker, and by amplifying these differences in the light, it enhances contrast. Phase-contrast microscopy allows for the detailed observation of living organisms, especially the internal structures. refractive index: the ratio of the speed of light in air or vacuum to that in another medium. Phase-contrast microscopy is a method of manipulating light paths through the use of strategically placed rings in order to illuminate transparent objects. Dutch physicist Fritz Zernike developed the technique in the 1930s; for his efforts he was awarded the Nobel Prize in 1953. 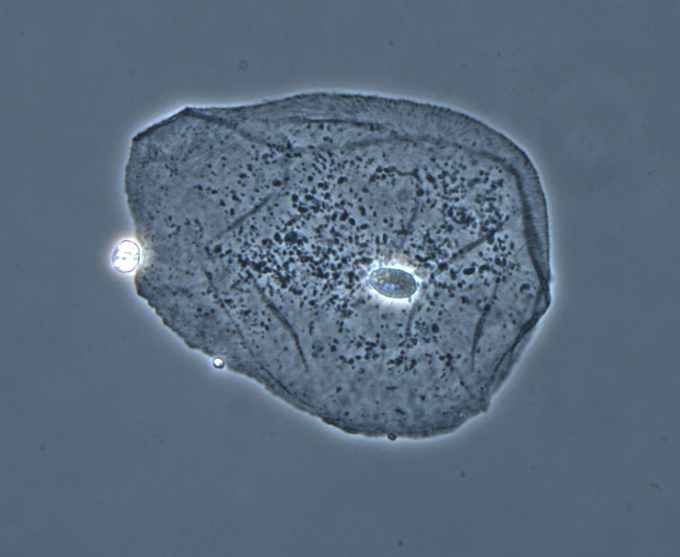 Phase-contrast microscopy: Phase-contrast image of a cheek epithelial cell. In phase-contrast microscopy, parallel beams of light are passed through objects of different densities. The microscope contains special condensers that throw light “out of phase” causing it to pass through the object at different speeds. Internal details and organelles of live, unstained organisms (e.g. mitochondria, lysosomes, and the Golgi body) can be seen clearly with this microscope. A phase ring in condenser allows a cylinder of light to pass through it while still in phase. Unaltered light hits the phase ring in the lens and is excluded. Light that is slightly altered by passing through a different refractive index is allowed to pass through. Light passing through cellular structures, such as chromosomes or mitochondria is retarded because they have a higher refractive index than the surrounding medium. Elements of lower refractive index advance the wave. Much of the background light is removed and light that constructively or destructively interfered is let through with enhanced contrast. Phase-contrast microscopy allows the visualization of living cells in their natural state with high contrast and high resolution. This tool works best with a thin specimen and is not ideal for a thick specimen. Phase-contrast images have a characteristic grey background with light and dark features found across the sample. One disadvantage of phase-contrast microscopy is halo formation called halo-light ring.